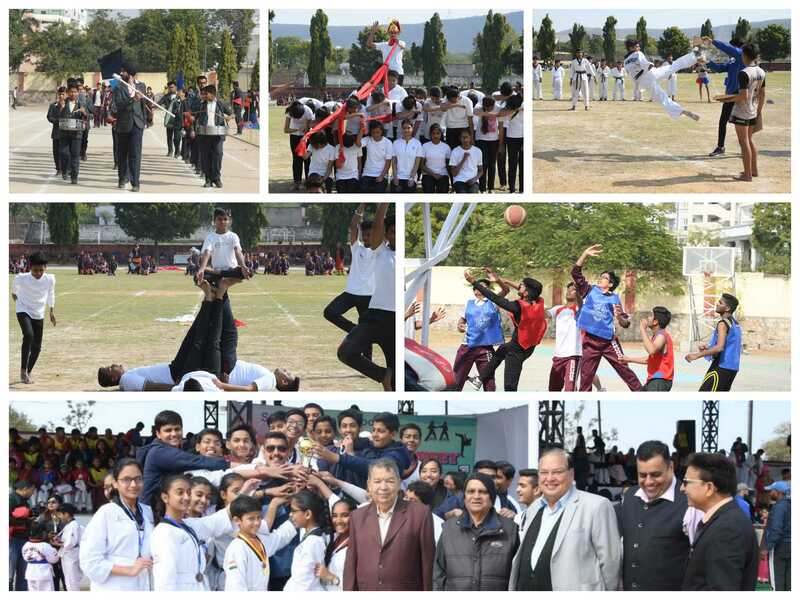 The much awaited Annual Sports meet of St Edmund’s School ,Jawahar Nagar brimmed the ground of Rajasthan UniversityJaipur with enthusiasm,excitement and cheers on 31st Jan2019, during which prelims of different races were conducted and shortlisted for the final round to be conducted on Annual sports meet.Mr Rafeeq Khan (MLA of Adarsh Nagar)& Sumit Bagasara(Vice president of National shooting player) joined on 25th Jan2019 to inaugurate the day with epitomy of energy. The event commenced with the School director Mr Sudhir Singh &Principal Mrs Anu Bhatia welcoming the esteemed gathering on 31st Jan with the chief guest Mr Gautam Bhansali(Rt.IG Crime branch) & Guest of honor Mr Ishmandhu Talwar(writer & renouned journalist) &Mr Sharad Gaur(Chief editor of replay news Jaipur).Mr Bhansali took the salute of the impressive march past of the students,coupled with some stirring marching music by the band.The students entered into the spirit of occasion in a grand way with the oath being administered by the sports captain.The four houses Shaurya, Parakram , Veer and Shakti presented their drills and won the hearts of the audience . It was delighted to see the excitement with which children challenged themselves to attempt variety of races and games such as Seven stones,Kabaddi,Kho kho,100Mt race,relay race,long jump,Basketball,volleyball,Throw ball etc..Many new records were made in 100Mt race & games.As the building atheletes of St Edmund’s School ran for the finishing line ,the Rajasthan University reverberated with enthusiatic cheers from the spectators.All the atheletes played with the true sportsman spirit. Announcement of the winnersof Shri Ranbir Singh tournament was done in which St Edmund’s School grabbed the first posiotion & second position was bagged by Subodh public school & third position to Bhartiya Vidhya Bhawan (Pratap nagar). In the pre primary wing Hammed, Hamza&Siddhart won gold, silver and bronze medal in jelly fish race. In cat & mouse race Asad,Abrar & Diya Sukhlani were the winners. And in flower race of Sr Kg Lavina,Sristhi,Krippi, Hammad, Avesh aur Sarvesh Meena won the gold, silver and bronze medals. In get ready for the school game Shah & Akshara won gold medal. Shiven & Kashish of Parakram & Veer House won the gold medal.In 100Mt Hurdle race Devesh & Anjali from Veer & Parakram house bagged the gold medal.In Dodge ball ,throw ball & Kabaddi Shakti house won the gold medal. In Kho Kho Veer House won the gold medal .In long jump Kartik Soni ,Ishaan & Kuldeep won the gold medal. In volley ball veer house won the gold medal & in basket ball match Parakram house won the gold medal.But at last Veer house chimed the bells of victory. The school young achievers were awarded & were applauded for their talent & their unmatched potential in the sports field. School Joint director Dr Pooja Singh emphasised on the importance of sports in a child's life. The sports meet concluded with a vote of thanks and singing of National Anthem.